Camping de l'Ill - Colmar is a campsite with 150 touring pitches. 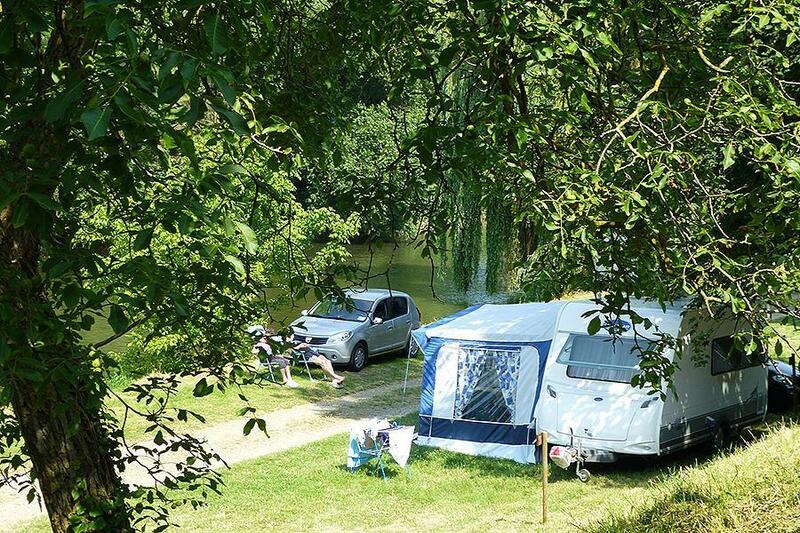 During low season, between 29-03-2019 - 29-05-2019 and 01-09-2019 - 23-11-2019, the nightly rate is €18,- at one of the 150 touring pitches at Camping de l'Ill - Colmar in Colmar (Haut-Rhin). At this campsite you can not only use your CampingCard ACSI for inexpensive camping, you can also use your ACSI Club ID (as an alternative ID). This campsite is located on the banks of the River Ill. Ideally located for visiting Colmar. Snack bar with pavement cafe. Heated pool. We stayed at this site as it was the only one with vacancies in mid September. We were given a smallish pitch by the river - the pitch was fine but the road noise was very intrusive. The plus side being it’s easy to get a bus into Colmar and from there a train to Strasbourg in 30 min which worked well. There is also a cycle track down a nearby canal. It was disappointing to find the restaurant closed in mid September. Water points were also a long walk away. The pool was heated and open and from here the road noise was much less which maybe the case on other pitches further from the river. It is OK if all you want to do is to visit Colmar but not otherwise. The motorway noise is intrusive and the site is a peculiar shape. The majority of the pitches are beneath trees which is good if it is hot sunshine but not when it either rains or the wind blows. We were very disappointed with this site, having stayed at their Angers site last year which was excellent. The pitches were narrow and very muddy following recent thunderstorms. There were no proper drinking water points. Despite being outside their low season, and therefore no benefit from our ACSI card, the restaurant was closed. There was considerable traffic noise from the nearby motorway/ access roads. There is a bus stop outside the site with a frequent service to Colmar. This site badly needs bringing up to modern standards and until it is we won\'t be staying again. Good site to use to visit Colmar easy cycling and buses to the centre from the site. Pitches and facilities need maintenance. Showers struggled to provide hot water - both nights had cold shower fortunately the weather was hot so quite refreshing. Long narrow site on the banks of the river. Only one ablutions block was open which was clean with plenty of hot water. Second, older block was closed - not sure if this is permanent or just for low season. Pitch was long enough for our MH (7.5m) but too narrow for awning. Site was clean, tidy and quiet. We only stayed as a stopover so never visited the town. Doubt I would make this a destination for a holiday. Located at the end of long drive with two toilet blocks in use. One refurbished. The other in serious need of refurbishment. Nice setting spread along River I'll. Bus from end of drive into town. We visited for 4 nights in May. It had rained very heavily for a day and night before we arrived which gave us a very muddy pitch. Someone we spoke with had moved from a lovely riverside pitch for fear of flooding. It had a major problem in that water had to be drawn from the Sanitary block sinks. An old block, closed and by the state of it ready for demolishing did have running water to the sinks so we used that. Waste was emptied down a rain drain. The new Sanitary block was kept clean and showers were really hot. The restaurant was not open until after we left. We didn't use the swimming pool. The receptionist spoke good English and was very pleasant. Free wifi at reception and a computer for use inside. Ideally located for the town. Bus stop at entrance. Supermarket a short walk. Excellent location for all the beautiful places around. This campsite us actually very well situated, though be aware that the position on the apps map is slightly wrong as it is a little further east of the motorway and alongside the river...but is well signposted.It is crying out for investment in improving the drainage and pitches...a few hundred tons of gravel woukd not come amiss to provide decent hardstanding. When we arrived about 7.30pm we were told the upper hardstanding pitches were full, so we drove around to look at the grass ones, which were all pretty waterlogged. With a 8.5m motorhome weighing over 4 ton there was no way we'd risk a wet grass pitch. Luckily a hardstanding space became available just as we were about to leave. The main shower and loo block is clean and up to date, though no soap dispensers. The restaurant was closed for all of June..why,?? ?..but there is a lovely little swimming pool ( too rainy to use sadly)..and the staff are lovely...3 young girls all multi lingual and pleasant.There is a bus stop just over the road at the entrance and buses to town every 10-15 mins...last one back 1.00am!! With some improvements to pitches this could be a first class site. Would use this site again for it is very convenient and good value for money. Although the the site was very busy the restaurant and one toilet block was closed. There were not enough shower/toilet facilities and one of the two sets that were open were a disgrace - I know this is France but please at least keep things clean. I will not go back because of this and if we did not have friends in a mobile home on the site we would have left. Receptionists were helpful. Disappointing. The reception staff were quite surly and directed us to camp on the 'Grande Prarie'. This was a grassed area in front of the river that was very uneven with random electric points. It also appeared to flood and as bad weather was forecast we had reservations about it's suitability for a motorhome. On complaining that there was no suitable place there we were reluctantly reallocated a numbered pitch on the top terrace that was flat but not particularly attractive. The toilet/shower facilities nearest to our site were closed and the those that were open were very poor and desperately in need of renovation. Although there were several water points in the site we could find none that were working. The only motorhome facilities were at a borne that had to be paid for. The restaurant and bar were closed. Having said all that the price was cheap and it would appear that renovations were going to happen, plus the site was very convenient for visiting Colmar which is a lovely place by bus or cycle and there is a good supermarket nearby. Would you like to book Camping de l'Ill - Colmar or request more information? You can do both using the information below or by visiting the campsite's website. Leave the A35 via exit 25, then D415 direction Freiburg. After 3 km at roundabout via D418 to Horbourg-Wihr. Follow campsite signs. CampingCard ACSI will send your information request to "Camping de l'Ill - Colmar".